Pentathlon. Rococo. Japery. Cyanosis. Those are just a handful of the words middle school student Ryan Garvan successfully spelled at the recent King-Snohomish Regional Spelling Bee to earn third place. 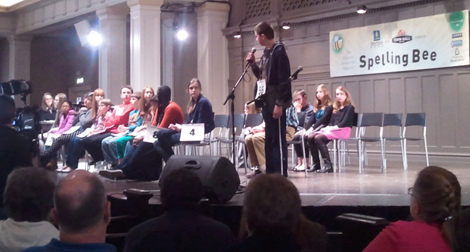 It was the second time Garvan had competed in the regional bee along with 60-70 other middle-schoolers in Seattle’s Town Hall. Garvan, who attends classes in the parent partnership program at Sky Valley Education Center, won the Sky Valley Scripps Spelling Bee two years in a row to qualify for the King-Snohomish Regional contest. He said repeat participation doesn’t make it any easier to compete as each year there are new lists of words. “I was nervous,” said Garvan. He studied for the bee, reviewing the Spell It list published by Scripps for the competition, as well as the three-volume Verbomania spelling lists. “My parents tested me on a lot of words,” he says. The competition this year was fierce and lasted for four hours. After accurately spelling “discipline,” “vaccine,” “promethean,” “bunyanesque” and more, Garvan was finally stumped by the word “ostreiform,” which means shaped like an oyster. He missed it by just one letter. “People were impressed that I spelled bunyanesque,” he says. He asked for the definition, which helped him determine that the word was not a derivative of “bunion,” but rather of Paul Bunyan, the lumberjack figure in North American folklore. Garvan is already making plans to compete in next year’s bee. It will be his last year of eligibility. “I like spelling,” he says.